Without Palestinian Susiya, what would be Peace? I cannot imagine what any sort of peace in Israel-Palestine would look like if the planned demolition of the Palestinian village of Susiya by Israeli occupation forces and the displacement of its residents to outside of Area C of the West Bank goes ahead. The case of Susiya is by now well known and has been a focus of sustained legal and grass-roots campaigns by Rabbis for Human Rights and B’Tselem (click on the links for detailed information). But it is astounding that the village is now facing its third destruction and dispersal. It began with the establishment of the Israeli settlement of Susiya in 1983 on Palestinian land, followed in 1986 by the eviction of the villagers after their land was declared a Jewish archaeological site. That says a lot about how occupation works – the justification of Jewish presence of the land in the past comes at the cost of Palestinian presence on the land (documented since Ottoman times) in the present. The Israeli settlement project in the West Bank (and elsewhere) entails an exclusive Jewish right to settle on the land, and hence the dispossession of the Palestinians who are already settled. Since 1986 the villagers have been trapped in a Kafkaesque Catch 22. They relocated to other agricultural land and built temporary structures in addition to using caves, but the occupation authorities never approved any plans for reconstructing the village, meaning all construction was technically illegal. In 2001 the occupation authorities demolished the village as revenge for the murder of an Israeli settler in Susiya, and since then there have been a series of demolition orders, petitions to the Israeli High Court by the villagers, and temporary stays of demolition. Since 2001 the villagers and their property have been attacked repeatedly by settlers who have also blocked access to their land, Despite numerous complaints filed with the Israeli authorities, there has been almost no redress. In 2013 the occupation authorities rejected a plan for the village, proposing instead to relocate the villagers into Area A, which the villagers have petitioned against. The Israeli High Court is due to consider the case again on August 3rd 2015, but on May 4th the court denied a request for an interim injunction against demolitions, and occupation authorities announced that the destruction would go ahead between July 20th and August 3rd. I have posted previously about how the relocated village of Susiya is itself an archaeological site that tells the story of occupation. Now it has become the site of an intensive campaign to save Susiya. As usual, there is an online campaign: the hashtags #savesusiya and #standwithsusiya; the Facebook page Stand with Susiya; a Thunderclap petition; an email campaign by Jewish Voice for Peace to John Kerry; a letter campaign by the International Solidarity Movement to EU officials and Israeli embassies; and no doubt some more. The impending demolition has already attracted international attention. Spokesperson for the US State Department John Kirby said on July 16th that the demolition “would be harmful and provocative,” and Israeli Channel 2 TV news broadcast his statement. The Guardian newspaper was among the international press that had already covered the story in June. Yet, what will matter more than all of this will be non-violent direct action on the ground. Rabbis for Human Rights are trying a last minute intercession through their lawyer, who referred to the planned eviction as transfer. At the same time, they and other groups, such as the Popular Struggle Coordination Committee have called for action in the village, including a demonstration on Friday 24th and a constant presence of Israeli and international supporters. Maybe all together, the campaign will halt the demolition until August 3rd, but even then there is no guarantee that the court will spare Susiya from destruction. 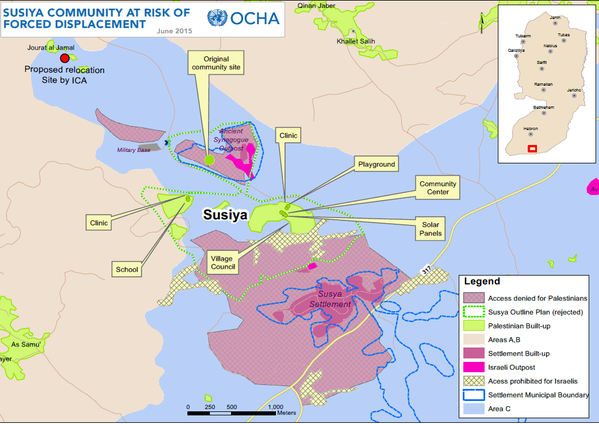 Why does Susiya matter? What difference would it make if a couple of hundred Palestinians moved a few kilometers? The case of Susiya is clearly a part of a pattern in Area C of the West Bank, where Israel retains full civil and military control, and where the “Civil” Administration’s planning powers are used cynically to enforce the creeping annexation of the area. As Area C is 60% of the territory of the West Bank, that would leave very little space for Palestinians to live, work and build on. It is not only a question of leaving no place for a Palestinian state, should the “two state” solution ever come to fruition. Whether there be one state, two states, or seven, there can only be peace if there is room for everyone to live. If there is demolition, eviction, displacement, transfer, and even if then there is no more violence as there is nobody left to oppress, but “quiet instead, there will not be peace. What follows victory is not peace but the shadow of war. The peace that might come, however, will be prefigured by the activists resisting occupation together. This entry was posted in Anti-occupation, Protest, social media and tagged Area C, B'tzelem, Israel/Palestine, Israeli peace activism, Jewish Voice for Peace, John Kerry, John Kirby, Popular Struggle Coordination Committee, Rabbis for Human Rights, South Hebron hill, Susiya on July 17, 2015 by Jon Simons.